In this Feb. 7, 2018, photo, the HealthCare.gov website is photographed in New York City. 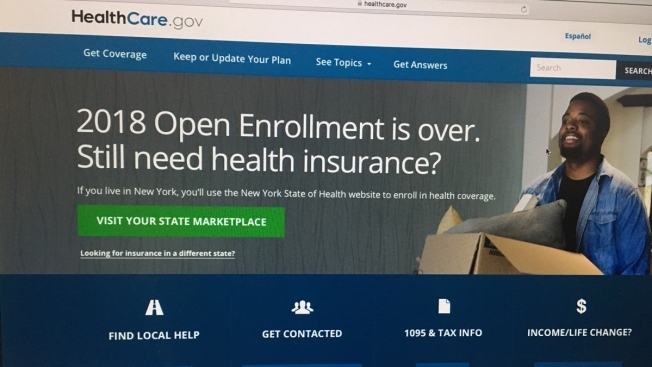 Call it the political equivalent of a death-defying escape: former President Barack Obama's health care law pulled in nearly 11.8 million customers for 2018, despite the Republican campaign to erase it from the books. An Associated Press count found that nationwide enrollment was about 3 percent lower than last year. California, with more than 1.5 million sign-ups, was the last state to report, announcing its numbers on Wednesday. Sixteen states increased their enrollment from last year, according to AP's analysis. Six of those were carried by President Donald Trump in 2016, while 10 went for Democrat Hillary Clinton. However, of the total number of people signed up this year about 6 in 10 live in states that went for Trump, according AP's analysis. "If you had asked me a year ago whether enrollment for 2018 would be almost equal to 2017, I would have laughed at you," said Larry Levitt, who follows the health law for the nonpartisan Kaiser Family Foundation. Total enrollment remained remarkably stable despite Trump's disdain for "Obamacare," and multiple attempts by the Republican-led Congress to repeal it. The Trump administration also cut the sign-up window in half, slashed the ad budget, and suddenly stopped a major subsidy to insurers, which triggered a jump in premiums. "The Affordable Care Act and the landmark protections and affordable coverage it provides are here to stay," House Democratic Leader Nancy Pelosi said in a statement. "These results show that people recognize how important coverage is for their health and financial stability," said Kristine Grow of America's Health Insurance Plans, the industry lobby. The Trump administration had no immediate reaction. Newly confirmed Health and Human Services Secretary Alex Azar is a critic of the health law, but he has avoided directly antagonizing Democrats over it. The White House line remains that "Obamacare" should be repealed and replaced, but Republicans in Congress don't have the votes. Still, nearly eight years after the ACA passed, the debate isn't likely to go away. The outlook for next year is dicey. Starting in 2019, Congress has repealed the law's unpopular requirement that most people carry health insurance or risk fines from the IRS. That's expected to embolden some healthy people to go without coverage, which would raise premiums for those left behind. People who are eligible for health law subsidies would be shielded from such increases, but those who don't get financial assistance would face another round of cost increases. The Trump administration is trying to address that by promoting lower-cost insurance alternatives that don't offer the comprehensive benefits available through the health law. But that also has drawbacks. If the lower-cost plans catch on with consumers, it could siphon healthy people away from the health law's comprehensive coverage. Meanwhile, bipartisan legislation to help stabilize insurance markets across the country appears to be struggling in Congress. Peter Lee, head of California's state-run market, says he believes insurance markets are still in jeopardy despite a good enrollment season. Overall enrollment dipped slightly in California, but the number of new customers increased. In a recent interview, Lee said he's concerned that the federal government isn't doing enough to advertise that coverage is available at attractive rates for people with modest incomes who qualify for subsidies. "Not promoting enrollment is a formula for higher premiums for many Americans," said Lee. A drumbeat of advertising is needed, he explained, because the pool of potential customers is constantly changing. For example, people who lose employer coverage may not know the health law offers them an option. "If you see overall enrollment dropping that is a formula for less healthy people covered and higher premiums," said Lee. Health law enrollment peaked at 12.7 million for 2016 and has declined every year since them. The dozen or so states running their own insurance marketplaces mostly outperformed the federal HealthCare.gov. Overall, the 39 states that use the federal website saw their enrollment slip by about 5 percent. Eight of the states that beat last year's number of sign-ups ran their own markets. Most state markets had longer sign-up windows than HealthCare.gov and some states advertised heavily. In fact, of the 12 jurisdictions running their own exchanges, eight gained enrollees - only California, the District of Columbia, Maryland and Vermont lagged behind 2017 levels.